"Orville Wright (1871-1948) and Wilbur Wright (1867-1912) requested a patent application for a "flying machine" nine months before their glorious flight in December 1903, which Orville Wright recorded in his diary. As part of the Wright Brothers' efficient practice of photographing every prototype and test of their various flying machines, they had swayed an attendant from a nearby lifesaving station to snap Orville Wright in full flight. The craft soared to an altitude of 10 feet, traveled 120 feet, and landed 12 seconds after takeoff. After making two longer flights that day, Orville and Wilbur Wright sent a telegram to their father, instructing him to "inform press." Detached from all these developments in the West, Sikkim preferred to live a secluded life even after its contact with British India. 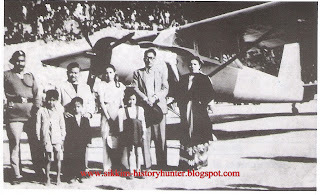 The then society of the former Himalayan Kingdom had never imagined about such kind of “flying machine” which was by now witnessed by the contemporary West. At that time, our society was for ever and a day guided by the mythologies which do not put up with any judgment in today’s perception. The people had a great faith on their mythological stories written in their religious books which always lacks logic and scientific standards to get fit in the modern perspectives. Accordingly, they might have a conception that an enormous religious person or the creator only can fly and take a round of sky. Such a social set-up of Sikkim was able to witness the huge “flying machine” nearly after five decades of its innovation by the Wright Brothers. This rare photograph is preserved by the Alley Family of Gangtok which was taken on the day when the unimaginable flying object landed at Palzor Stadium then known as Polo Ground. We do not have a clear idea about the event but, the huge crowd behind the helicopter suggests us that how curios were the Sikkimese commoners to see the “flying machine” in front of them. It arrived at Gangtok at such an age when just to see a vehicle was not less than a great fortune to a commoner.